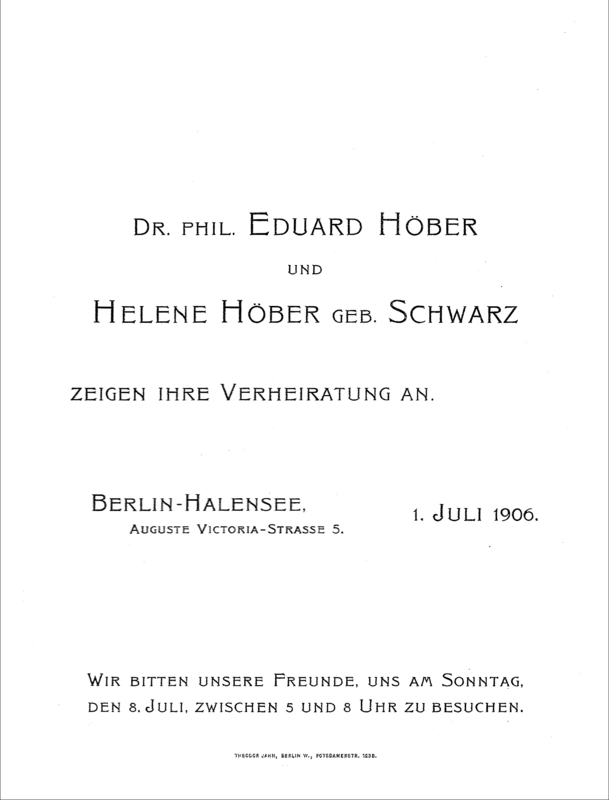 Dr. Eduard Höber, Ph.D. and Helene Höber née Schwarz announce their marriage. 5 August-Viktoria Street, Berlin/Hallensee, July 1, 1906. We invite our friends to visit us on Sunday, July 8 between 5 and 8 P.M.
August-Viktoria Street, Halensee, September 7, 1906. As the result of an accident, Dr. Eduard Höber, Ph.D., Editor of the Berlin Daily, died on September 3, 1906 in the Tyrol. Interment will take place on Saturday, September 8 at 5 PM at the Schmargendorf Cemetery, 38 Breite Street. The tragedy, of course, is in the dates. Eduard Höber and Helene Schwarz, elegant young intellectuals, had already made a place for themselves in literary and journalistic circles in Berlin when they married on July 1, 1906. Just two months later, when Eduard and Helene took their honeymoon trip to the Dolomite Alps on the Austrian-Italian border, Eduard was killed in a mountaineering accident. His body was returned to Berlin for burial. Eduard was the beloved elder brother of my grandfather, Rudolf Höber. The story of Eduard’s death on his honeymoon was one of my early posts on this website. You can read it by clicking here. Although I have a large archive of my family’s papers, I only acquired the images of these cards recently because of the Internet. Months after my original post, a Swiss historian, Hanspeter Frey, contacted me when he found my post in an Internet search. 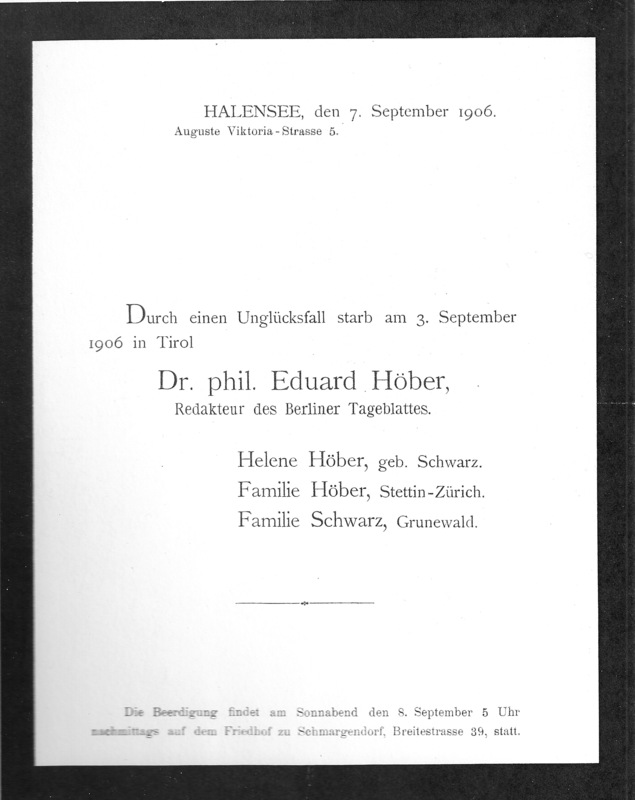 He had found the wedding announcement and death notice shown above among the papers left by a friend of Eduard and Helene’s, Robert Fäsi, in the manuscripts collection at the Central Library in Zürich, and sent me the scans. The Herr Frey also found several newspaper accounts of Eduard’s death published at the time of the accident in 1906. No one in our family had ever seen them before. You can read my translation of the reports by clicking here: News Accounts Combined — English — 1906-1907 . From these reports our family learned for the first time that Eduard’s death was caused by the criminal negligence of his mountain guide, who knowingly used a worn and defective rope to lead Eduard on his climb. Eduard died when he slipped and the safety rope provided by the guide snapped.